Cinnamon the clown is cute & gentle enough for a toddlers & zanny enough for pre teens too. She does magic, games, dancing, face paintings, balloons, puppet shows & clown school. Over 13 years experience. Even reinforces lessons parents teaches at home. Ask about that & our $30 off packages. Serving: Atlanta – GA – Georgia and the surrounding areas. Tickles the Clown is a professional clown entertainer who you need to contact to make your next Atlanta area Birthday Party or special event occasion a memorable one. Along with a great clown magic comedy show, Tickles can also provide face-painting services, balloon art, corporate event entertainment, and more! 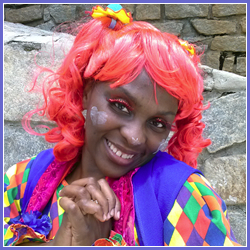 Call Tickles the Clown today for your next Atlanta area kids party, or visit the website for more information. Add a Clown Listing to The Clown Guide today! © Copyright Find a Clown All Rights Reserved.